Is This the Scanner Film Users Have Been Asking For? Made by Kodak, no less. Price $130. 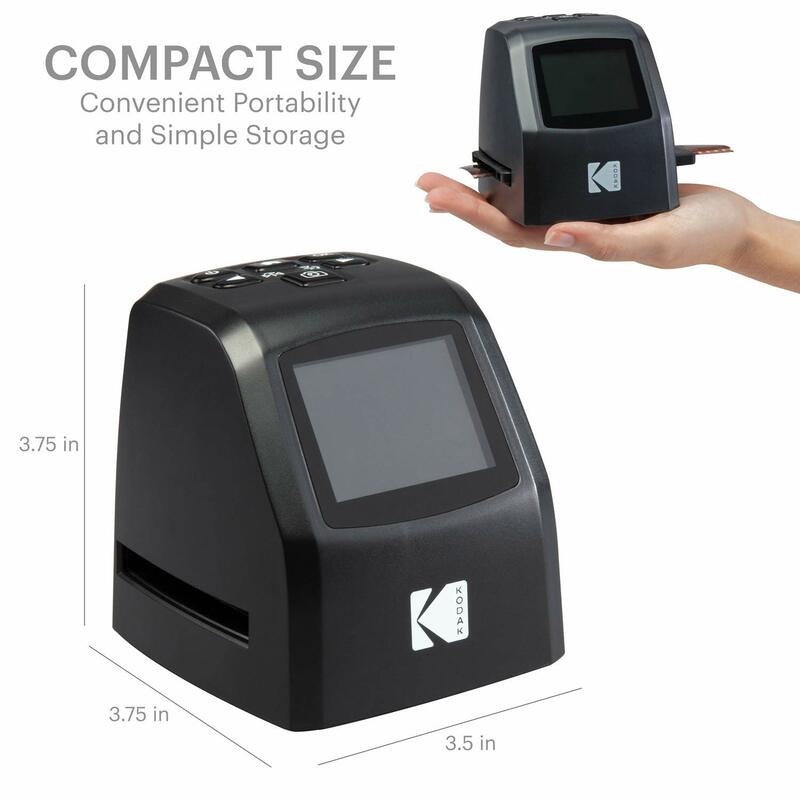 The ‘Kodak Mini Digital Film & Slide Scanner’ is a complete stand-alone unit (i.e. you don’t connect it to your computer) that converts 35mm film negatives into 14 or 22 mpx JPEG files. It’s small, has an integrated 2.4” LCD screen, one-press button operation, “simple user interface” and easy-load adapters for 135, 126, 110, Super 8 and Monochrome negatives and slides. It saves up to 128MB. 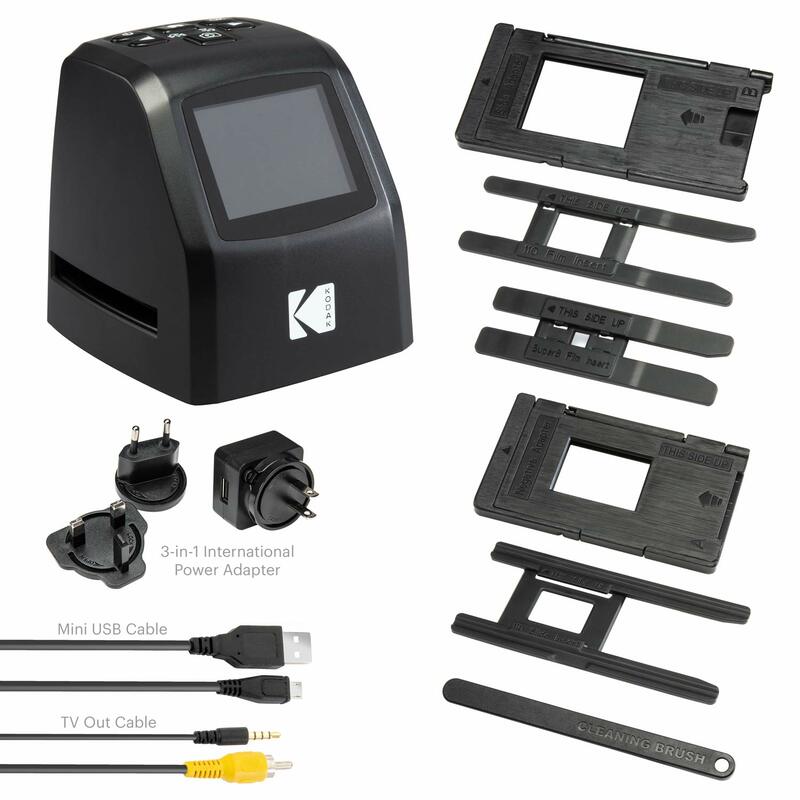 Plug to View: The back of the device features an SD card slot, mini USB power connection and TV-out connection with cables included. Continuous Loading: Film and slides move effortlessly through the gadget’s loading dock, providing faster, smoother performance. Buttons include power, left arrow/reverse function, home, ‘Ok,’ right arrow/flip function and scan/capture for one-press convenience. Extended Accessories Pack Includes Universal Power Source for US, EU & UK, Cleaning Wand, USB Cable & TV Cable Power Adapter; Send & View Images on Mac/PC Computers, Big Screen TV, Etc. No need for dedicated software programs, specialty machinery or even a computer to run it. Once your chosen adapter is installed, “smart technology” converts each slide or negative into a JPEG file that you can save via internal or external memory. Keep loading for “fast, continuous” photo scanning (I’ll believe that when I see it). You view and edit photos on the scanner, so there’s no need for secondary software. Once the image appears onscreen, you use the flip and reverse functions to change orientation, adjust brightness and RGB values. 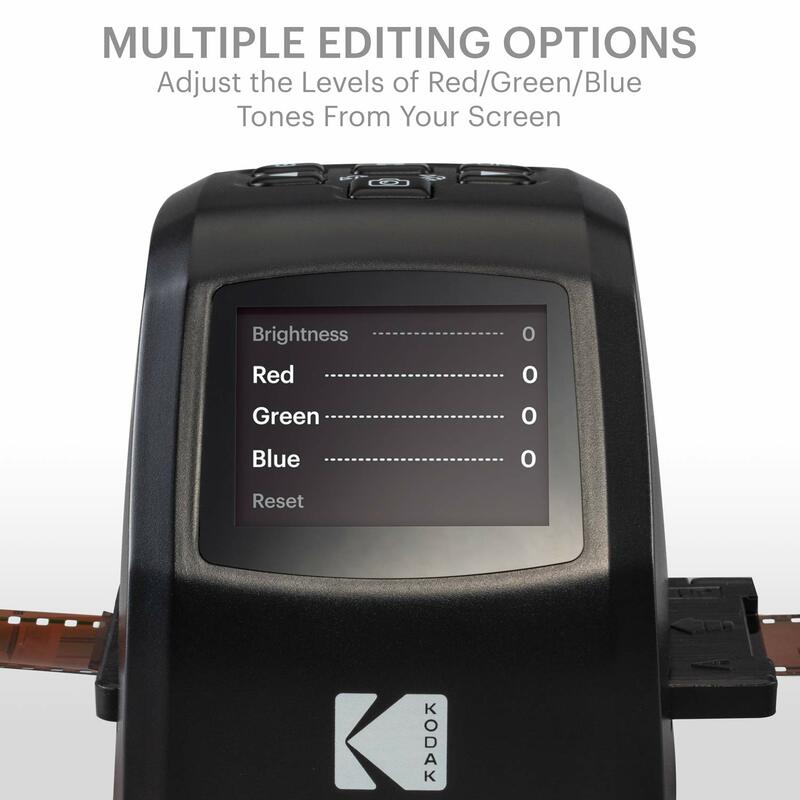 Depending on the film scanned, the scanner allows you to “enhance resolution from 14 to 22 megapixels,” whatever that means. The only real downsides I see are these: First there’s no bulk scanning option like the Pakon, where you can scan an entire roll at one go; scanning is limited to single frames, with the caveat that it claims “fast, continuous” scanning if you’re willing to sit and feed it. Second, it’s limited to JPG output, so it may not be the best solution for those who intend to significant post-processing. For sharing output on the web, or simply for digital archiving, it looks really interesting. This entry was posted in analogue photography, Film photography and tagged Film Scanner on February 15, 2019 by Leicaphila. I would say probably not, but if you really must, here in Blighty Amazon is flogging the same kit for 50 quid ($65), the only difference is someone forgot the Kodak badge, which unless in the context of actual film, is pretty much meaningless these days anyway. I wish that Leica would take film a bit more seriously and work up a simple device with a decent scanning camera, it’s not as if they don’t have experience with the genre. Having said that, my scanner, a Plustek 120 runs german software and it is labyrinthine in the way that it operates, the help is very similar. So if the software for the mythical Leica scanner is of the same ilk, it will let down any quality advantage. Even though I resent buying expensive software twice, I have come close on a few occasions to buying the Hamrick software, which on the face of it looks like a good compromise. I bought an identical looking scanner at Best Buy that wasn’t Kodak branded. It was very affordable, but the scans were utter crap. Assuming it’s the same scanner, don’t waste your time or money. When I finally started using a digital camera to scan my negs I realised how good this method actually is. Yes there’s a bit of outlay, more so if you haven’t got a DSLR/Mirrorless lying around, and a good copy stand is useful. With my old Fuji XE-1 and the wonderful Micro-Nikkor 55/2.8 Ai-s (with extension tube to fill the frame with the negative) I get results that far surpassed my Plustek 8100 for 35mm and Epson V700 for 120. Once set up scanning a 34 exp roll in raw takes 10 mins at most and the quality is incredible. I just wished I’d gone down that route sooner instead of shelling out for the two scanners (long since sold). @Ashley, I have seen many versions of this, from using adapted slide copiers to using an iPhone app. Some of the people that have written about it prefer to stitch multiple shots together to make one file, others are happy to use something like Abe Fettig’s app (FilmLab) which began as a Kickstarter and keeps improving. I still haven’t mustered up the courage to flog my neg scanner, indeed when my Nikon failed I spent a fortune on the Plustek 120. They all leave me thinking I should spend more time in the darkroom, which in itself limits the number of prints that can be made from the contacts. So, it would be interesting to hear what method you use that makes you so happy to bin your traditional scanner.